Photo: Hudson Wilson House, ca. 1876, 104 First Avenue, NW, Faribault, MN. Listed on the National Register of Historic Places in 1982. Photographed by User:Elkman (own work), 2007, [cc-by-3.0 (creativecommons.org/licenses/by/3.0)], via Wikimedia Commons, accessed April, 2014. Rice County administrative offices are located at 320 North West Third Street, Faribault MN 55021; phone: 507-332-6100. Rice County is located in southeastern Minnesota, approximately fifty miles south of Minneapolis-St. Paul. The county's borders follow the straight lines of the government survey system. Scott and Dakota Counties border the county to the north, Steele and Waseca to the south, Goodhue to the east, and LeSueur to the west. The Cannon River is Rice County's principal river and dominant topographic feature: it flows northeasterly and divides the county into two distinct regions. The area lying north and west of the Cannon was part of the state's Big Woods area and was originally covered with a heavy hardwood forest. The region is rolling and pocketed by many lakes, with often steep and frequent hills that rise to as many as 100 feet above the surrounding countryside. In contrast, the portion of the county south and east of the Cannon River is a gently rolling prairie region with no lakes. The county's second principal river, the Straight, joins the Cannon at Faribault in the south central part of the county. A strip of timber three to four miles wide along its banks comprised the only forested region south and east of the Cannon. Although heavy forests originally covered 2/3 of Rice County, most of the land has been cleared and agricultural land uses predominate. Today approximately 65% of the county is classified as cropland, whereas only 15% is woodland. Rice County shares with other Minnesota counties an early history of Indian occupation and white exploration and fur trading. Prior to the opening of Rice County lands to white settlement, the region was inhabited by the Wahpekute band of the Sioux. The present site of Faribault at the junction of the Cannon and the Straight Rivers was the location of a permanent Sioux village. The beginnings of continuous white occupation of Rice County date to the fall of 1826 when Alexander Faribault established a trading post at the foot of Cannon Lake under license of the American Fur Company, successors of the Northwest Fur Company. Ten years later he moved his post to a site three miles east of present day Faribault and in 1844 to the site of Faribault. Rice County lands were opened to white settlement in 1851 and the county was named for Henry M. Rice, the first United States senator in congress from Minnesota. It was officially organized in 1855 with nearly the present boundaries; the same year the county seat was removed from Cannon City to a permanent location at Faribault. Initial settlement was concentrated in the Straight and Cannon River valleys and along the shores of the many lakes in the western part of the county. By 1858, however, all of the townships had been organized, and systematic settlement of the county followed. Immediately following the opening of lands to settlement was a period of rapid settlement and town platting: some thirteen townsites were platted between 1854 and 1860, and by 1860 county population numbered an impressive 7,543. The three towns to achieve greatest prominence during this early period were Faribault (1854), Northfield (1856), and Dundas (1859). All three communities share a history as prominent and successful early flour and saw milling centers. Their success can be attributed to the combination of their river locations and ready access to a continuous source of water power, and the astute foresight of their respective founders, Alexander Faribault, John W. North, and John S. Archibald. Faribault, in addition, had the advantage of being the county seat, and was selected in 1858 as the location of the Minnesota State Institute for the education of the Deaf and Dumb. With Bishop Henry B. Whipple's arrival in 1860 it also became the See of the Episcopal Diocese in Minnesota, setting a precedent for the establishment of state and religious institutions in the county. Other plats dating to this early period are Cannon City (1855), Wedgwood (1855), Morristown (1856), Lake City (1856), Warsaw (1856), Shieldsville (1857), Millersburg (1857), Walcott (1857), Wheatland (1857), and East Prairieville (1858). Of these, only Morristown grew to become an incorporated community. Whereas the early platted communities were usually initiated by native-born American speculators and settled both by American born and immigrant groups, a notable Rice County exception is Shieldsville, founded in 1856 by Irish-born General James Shields as a colony for Irish immigrants. Shieldsville became the focus for a rural Irish community in western Rice and a small portion of eastern LeSueur Counties. Other prominent immigrant groups to settle the county's rural areas were Norwegian, German, and Czech, concentrated respectively in the eastern, southwestern, and northwestern parts of the county. The only Catholic hamlet (a common settlement pattern in neighboring LeSueur and Scott counties) in the county is Veseli, organized as a rural Czech congregation in 1874 and platted in 1880. The immigrant groups were some of the earliest to farm rural Rice County's fertile soil, and agriculture has been an underlying theme in the county's development since the mid-1850s. An important function of the towns in the area was to service the surrounding agricultural region. Over the years area agriculture adapted to a changing economy, technology, and market. At first, as in neighboring areas, subsistence farming dominated. Wheat became the dominant crop in the 1870s with a shift to diversified farming in the 1890s. Dairy farming and stock raising became increasingly important in the early twentieth century. The availability of water power, hardwood forests, fertile soil, and a growing population, plus the Episcopal Diocese and the promise of state institutions at Faribault, were important factors in Rice County's early settlement and development period. The coming of the railroad in the mid 1860s further stimulated the county's economy. Railroad construction in Rice County occurred in three phases and spanned nearly five decades, transforming already established communities to prosperous trade and manufacturing centers and causing new communities to form and others to relocate or stagnate. In 1864-65 the Minnesota Central constructed the first line through the county, making connections between Minneapolis, Mendota, and Faribault, and in 1866 to Owatonna. The line brought significant growth to three well-established communities (Northfield, Dundas, and Faribault) creating a wider market for products milled and manufactured there and improved access to the educational institutions located there. During this early railroad period the county's role as a center for education became more secured with the establishment of several additional institutions. State institutions for the deaf, dumb, and blind were opened in Faribault in 1866 and for the mentally retarded in 1879. Faribault's fledgling Episcopal mission had become three distinct institutions of high repute: the Seabury Divinity School, Shattuck School, and St. Mary's Hall. Northfield joined the educational scene with the establishment of two private colleges: Carleton College in 1866 and St. Olaf's School in 1874. Thenceforth, Faribault and Northfield took on dual roles as centers for education and commerce. The subsequent rail development periods reinforced the educational institutions and caused the cities' respective economies to flourish as industries were established and the regional importance of these centers increased. The construction of a Minnesota Central line between Red Wing and Waterville in 1882 introduced a second period of rail construction. It brought east-west connections to Northfield, Dundas, and Faribault and rail service to Morristown (a small milling town in southwestern Rice County) for the first time. Within a few years two additional lines reached the county. In 1884 the Chicago, Milwaukee, and St. Paul built a line between Cannon Junction (near Red Wing) and Northfield, and in 1886 the Minnesota and Northwestern constructed a line across parts of eastern Rice County connecting St. Paul and Austin. Nerstrand was platted along the latter in 1885; it had previously been a loosely organized rural Norwegian community. The early milling town of Dundas flourished during the early railroad periods but was unable to compete with nearby Northfield and Faribault and declined after 1890. The turn-of-the-century saw the completion of Rice county's rail network with the construction of four additional lines in 1902, 1903, 1904, and 1911. The Burlington, Cedar Rapids, and Northern (Chicago, Rock Island, and Pacific) completed rail service to the southern markets by connecting Comus (located five miles north of Faribault) and Albert Lea. In 1903 rail service reached northwestern Rice County for the first time with the construction of a Chicago, Milwaukee, and St. Paul line between Farmington and Benning, and two new communities, (Lonsdale (1902) and Webster (1904), were platted as a result of this line. Lonsdale is the only community in the county to have been established by a railroad land company; it was platted by the Milwaukee Land Company in 1902. The Chicago, Milwaukee, and St. Paul also constructed the line between Zumbrota and Faribault in 1904. In 1911 an electric commuter line was completed between Minneapolis and Northfield, the last rail line to reach Rice County. During the railroad expansion periods of the latter nineteenth century, Northfield became an important local commercial center, and Faribault took on an increasingly greater position of regional importance Northfield's milling and agriculture-related industry remained a focus for the community and an array of commercial establishments developed to support what was increasingly becoming a college centered community and service center for the surrounding agricultural region. Faribault's commercial development followed an initial pattern similar to Northfield's but by the late-1880s and early 1890s had become a regionally important trade and manufacturing center. Lumber processing industries replaced the early sawmills, and large agriculture related industries such as the Faribault Canning Company and the Farmer Seed and Nursery Company were established. Wholesale warehouses sprang up along the riverfront as the city became an important distribution center. Faribault had become an important link in a network of southern Minnesota cities: similar phenomena are seen in such cities as Mankato, Albert Lea, and Red Wing. The county's layout has remained relatively intact since the completion of the railroad system. Northfield and Faribault, which flourished during this period and assumed their present positions of importance as centers for education and commerce, continue to be the principal towns in the county. The smaller towns reached by rail — Dundas, Morristown, Nerstrand, Lonsdale, and Webster — grew as a result of rail expansion but never were able to compete with the larger centers. The downtown areas of all these towns reflect their respective years of peak railroad influence. Other rural townsites such as Cannon City (1855), Millersburg (1857), and East Prairieville (1858) never grew because they were completely bypassed by the railroad. Excepting Faribault and Northfield whose schools have achieved national reputations, Rice County's towns primarily cater to the local market and service the surrounding agricultural region. Agriculture and agriculture-related industries predominate. The many lakes in the western part of the county have been popular vacation and settlement spots since the platting of speculative townsites on their shores; the tourism and resort industry has continued to be a minor but important part of the county economy. Several substantial year-round lakeside residential communities are now focused around such early plats as Shieldsville, Warsaw, and Lake City. In recent years, the county's location of the fringe of the Twin Cities metropolitan area has assumed increasing importance, creating competition for local markets. The northern tier of townships, particularly in the Lonsdale and Northfield area, have experienced growth due to an influx of a commuting population. Rice County's architecture follows the building patterns common in other midwestern areas. The earliest buildings were of log, sod, or dugout construction. As the settlers became more established, these were replaced by more substantial structures of wood frame, stone, or brick construction, depending of the availability of materials and personal preference. Wood is the most common building material found in both domestic and agricultural buildings and was also used in the construction of early commercial buildings. Stone buildings were constructed in areas of the Cannon River Valley where stone was quarried locally. Brick was also manufactured locally in most regions of the county, and brick houses are scattered in both rural and urban areas with a concentration in the Faribault area. By 1870 masonry construction replaced most of the frame commercial buildings in the county's urban centers. Architectural ostentation is rare in the county's rural areas and small communities, but many architecturally distinctive buildings are found in Faribault and Northfield. In both cities are examples of local variations of a wide array of the popular architectural styles of the period for residential, commercial, and public buildings. The concentration of state and private campuses, provides a particularly complete representation of styles popular in public buildings during the period from the 1860s to the 1930s. Urban structures tend to line streets that follow a grid system; in river and lake oriented communities the grid has been modified to fit the topography. Northfield's Cannon River focus is a particularly interesting departure from the standard linear town. The county roads follow the grid pattern of the government survey system where uninterrupted by lakes and rivers. On the current county highway map, the focus that Faribault and Northfield provide is accentuated by the road patterns: in the vicinity of these cities the roads appear as spokes on a wheel, leading to the county's principal centers. Many of the county's lakeshores are lined by lake homes and cottages. The cultivated landscape is broken by groves of trees and buildings of farmsteads, occasional rural schools and churches, scattered townsites and crossroad communities. At the beginnings of white settlement in the 1850s, the major significance of the area now known as Rice County was as a frontier region of south central Minnesota. The presence of such noted Minnesota pioneers as Alexander Faribault, John W. North, the Archibalds, and, Bishop Henry B. Whipple greatly influenced the county's early development. With the construction of a rail network connecting the region to the surrounding agricultural regions of the state and beyond, the county became increasingly significant as an important component of the agricultural producing and processing region of southern Minnesota, and Faribault itself as a regional center for trade and commerce. Rice County's principal communities, Faribault and Northfield, are additionally significant for their contributions to state and private education in Minnesota from the early settlement period to the present. A period of town founding, agricultural development, and commercial and industrial expansion followed the opening of Rice County lands to settlement in 1851. The Cannon River Valley cradled the early years of settlement, and the three towns that achieved greatest prominence during this period (Faribault, Dundas, and Northfield) were all platted in the valley. The Alexander Faribault House (1853, Faribault, placed on the National Register in 1970) is the structure most representative of Rice County's initial white settlement period. The house was built in 1853 by the county's first permanent white settler and founder of the city of Faribault. Also associated with Faribault's initial settlement period and reflective of the permanence of this fledgling community are two prominent churches dating to the 1860s, the Congregational Church of Faribault (1867, Faribault, placed on the National Register in 1977) and the Cathedral of Our Merciful Saviour (1862-69, Faribault, placed on the National Register in 1979). The Congregational Church was constructed by the county's first congregation; the construction of the Cathedral shortly after the arrival of Bishop Henry B. Whipple in 1860 marked Faribault the See of the Episcopal Diocese in Minnesota. The significance of Faribault as an educational center also had its roots in the county's early development period. Whipple's arrival and the establishment of the Episcopal Diocese at Faribault set an early precedent for the area as an educational center. A small Episcopal mission school had been established as early as 1858, and was developed and reorganized after Whipple's arrival into a divinity school and secondary school for boys. Three structures located within the Shattuck Historic District (1869-1950s, Faribault) are associated with the schools' early period. These structures include Old Phelps Library (1869, Faribault, placed individually on the National Register in 1975), the Chapel of the Good Shepherd (1871-73, Faribault, placed individually on the National Register in 1975), and the School House or "Lodge" (1870, Faribault). Structures which represent the beginnings of significant industry during the early period are the Archibald/Dundas Mill (1857-1879, Dundas, placed on the National Register in 1976) and the E. T. Archibald House (c. 1860, Dundas, placed on the National Register in 1976). The Archibald Mill, best known as the first mill in the United States to manufacture and market patent flour, maintained for years a reputation as a leader in Minnesota's milling industry. The E. T. Archibald House was the residence of one of the prominent Archibald millers during the peak years of the industry. The Ault Store (1866, Dundas) and the Martin House (1869, Dundas) are locally distinctive commercial and residential structures which also reflect Dundas' thriving early milling period. Two small Episcopal churches constructed in neighboring Dundas and Northfield, Church of the Holy Cross (1868, Dundas) and All Saints Church (1866, Northfield) represent the differing patronages of the two towns and the American-born heritage of their early settlers. The stark simplicity of All Saints contrasts sharply with the warmth of Holy Cross with its masonry construction and imported furnishings. While Faribault, Dundas, and Northfield were being established as early milling towns on the Cannon River and settled largely by American-born (and some Canadian) settlers, the rural areas were also being cleared for settlement and early agricultural activity. The Drake Farmhouse (c. 1863, Bridgewater Township) is a notable structure associated with the county's early agricultural development and the American-born population that settled parts of rural Rice County. It was the second home to be built on the site by one of the area's first families. Immigrant groups were also responsible for much of the county's rural settlement and agricultural development. Valley Grove (1862/1894, Wheeling Township) and the Bonde Farmhouse (1875, Wheeling Township) represent the Norwegian population that settled in the eastern part of the county. The churches at Valley Grove provided a focus for the loosely organized rural community, and the Bonde Farmhouse is an excellent example of the residences constructed by area settlers after they had achieved a degree of stability. The Thomas Veblen Farmstead, (c. 1875, Wheeling Township, placed on the National Register in 1975) is also associated with Wheeling Township's Norwegian population, and is notable as the childhood home of Thorstein Veblen, world renowned economist. A second important immigrant group to settle the rural countryside was the Irish. St. Patrick's Catholic Church and Parsonage (1888/1880, Shieldsville Township), located on the townsite of the unincorporated community of Shieldsville; best represents the Irish population that settled portions of western Rice and eastern LeSueur Counties. Shieldsville had been platted by General James Sheilds in 1856 as an Irish colony. The county entered a second phase of development with the coming of the railroad. Rail construction spanned nearly five decades, and occurred in three phases, during the 1860s, and 1880s, and the early 1900s. The increased development of the early railroad periods led to accelerated building activity in pre-existing communities and the establishment of new towns as the lines penetrated the more sparsely settled regions of the county. The Rock Island Depot (1902, Faribaflt) is the best extant representative of the trackside facilities constructed in the county's six platted communities where the railroad played a major developmental role. It also represents the completion of the railroad linking Faribault to the major cities of central and southern Minnesota and beyond. Three structures represent the new communities established on the rail lines. The Osmund Osmundson House (1880, Nerstrand) and the Nerstrand City Hall (1908, Nerstrand) are notable structures in the community of Nerstrand, platted in 1885 by Osmund Osmundson when the Minnesota and North Western built a line through eastern Rice County. Lonsdale was Platted by the Milwaukee Land Company in 1902 on the Chicago, Milwaukee, and St. Paul which crossed northwestern Rice County. The Lonsdale School (1908, Lonsdale, placed on the National Register in 1979) provides a link both with the establishment of this railroad community and with the Czech population that dominated the area. Northfield and Faribault secured their positions of prominence during the railroad construction period. The Northfield Historic District (c. 1865-1900, Northfield, placed on the National Register in 1979), which includes the Scriver Block Building (1867, Northfield, placed on the National Register in 1978), and the Faribault Historic Commercial District (c. 1870-1900, Faribault) constitute the best representation of the commercial expansion that occurred in the county's two principal centers of commerce after the coming of the railroad. Notable residences associated with the leaders and builders of the communities during the first phases of rail construction and commercial expansion include the Hudson Wilson House (1876, Faribault), the Nutting House (1887-88, Northfield, placed on the National Register in 1970) and the D.H. Lord House (1887, Northfield). Wilson and Nutting were prominent leaders in the towns' commercial and banking communities, and D.H. Lord was a local builder responsible for the construction of many of Northfield's more notable buildings. By the late 1880s and early 1890s, Faribault entered an accelerated phase of economic development as an increasingly important regional center of trade and commerce for southern Minnesota. This period saw the construction of several new kinds of structures associated with towns of greater regional significance. Warehouses, represented by the Theopold Mercantile Co. Wholesale Grocery Building (1893, Faribault), were constructed along the railroad/riverfront east of downtown. In addition, Faribault's increased role as a major agricultural processing and distribution center is reflected in the Farmer Seed and Nursery Company (1890-1909, Faribault), which moved to Faribault in 1894 from Chicago. The John Hutchinson House (1892, Faribault) and the Cassius M. Buck House (1895, Faribault) are notable residences representative of those constructed by area elite during Faribault's peak period of commercial development. The Hutchinson House also represents the position of furniture manufacturing and lumber-related industries in Faribault's late nineteenth century economy. The late nineteenth century also saw a number of civic improvements best represented by the Faribault City Hall (1894, Faribault). In the same year the city purchased the Faribault Water Works (1883/1938, Faribault) as part of the expanded municipal services they offered the citizens of Faribault. Faribault's educational institutions flourished during the railroad period; the reputation of the city's Episcopal schools became widespread. Seabury Divinity School moved to a new campus in the 1880s; Johnston Hall (1888, Faribault, placed on the National Register in 1975) is the best surviving structure associated with the institution from this period. After the divinity school moved, Shattuck thrived as a military boarding school for high school boys. The prominent Shumway Hall/Morgan Refectory (1887-88, Faribault, placed individually on the National Register in 1975, located within the Shattuck Historic District) were constructed as the principal campus structures after the divinity school moved. Subsequent development of the campus occurred at the turn-of-the-century, and during the 1920s and the 1950s. St. Mary's Hall, the Episcopal high school for girls, also flourished during the expansion period of the 1880s; it moved from the Whipple's home to its present blufftop location in 1883. The institution is represented by St. Mary's Hall (1926, Faribault), constructed to replace the 1883 structure after a tragic fire in 1924. Faribault had been selected as the location for a number of state institutions for the handicapped as early as 1858, and schools for the deaf, dumb, and blind were opened in 1866, and for the mentally retarded in 1879. The first generation of buildings from these institutions has vanished. An especially distinctive structure at the School for the Deaf is Noyes Hall (1901-1910, Faribault, placed on the National Register in 1975), constructed in 1901. The Oaks Building (1900, Faribault) at the State School for the Feeble-Minded (Faribault State Hospital) is another notable institutional structure, particularly significant as the location of Dr. A. R. T. Wiley's psychological laboratory. Wiley was the first clinical psychologist to be employed by a mental retardation institution, and the primacy of his studies in the field of mental retardation is well-recognized. Laura B. Baker of Northfield was also an innovator in care for the mentally retarded with her work in special education methodology and non-restrictive programs for educable, retarded children. She established the Laura Baker School (c. 1880, Northfield, placed on the National Register in 1978) in 1898. Northfield became a second center of education in the county during the early railroad period with the establishment of two private colleges. Carleton was founded as a Christian College of the Congregational Church in 1866, and St. Olaf was established as a Norwegian Lutheran high school in 1874, added a college department in 1886, and became the official college of the United Lutheran Church in 1899. The beginnings of both schools are best represented by their respective first major academic building: Carleton's Willis Hall (1868-72, Northfield, placed on the National Register in 1975) and St.. Olaf's Old Main (1877, Northfield, placed on the National Register in 1976). Goodsell Observatory (1887, Northfield, placed on the National Register in 1975) on the Carleton College campus is also a distinctive structure from this period. Turn-of-the-century expansion included the addition of detached library facilities at both schools: Carleton's Scoville Memorial Library (1896, Northfield) and St. Olaf's Steensland Library (1902, Northfield). The construction of both these structures completed the historic core of buildings on their respective campuses. The O.E. Rolvaag House (1912, Northfield, placed on the National Register in 1969, National Historic Landmark), the home of a world renown author and a St. Olaf professor is located just east of the St. Olaf College campus. The development pattern established during the railroad construction period continued well into the 20th century, with Faribault and Northfield becoming increasingly important educational centers and Faribault a regional center of commerce. Notable public buildings constructed in Faribault during the 1930s reflecting the county's development include the Thomas Scott Buckham Memorial Library (1930, Faribault), the Rice County Courthouse and Jail (1932-34/1910, Faribault) and the Faribault Water Works (1938/1883, Faribault). Architecturally significant Rice County structures are representative of the diffusion and adaptation of popular styles to the needs and preferences of area residents and builders. There is a notable scarcity of "high style" buildings in rural Rice County. Those structures with greatest attention to style are concentrated in the county's principal urban centers. Rice County's buildings constitute a remarkably complete representation of the major styles popular in residential, commercial, ecclesiastical, institutional, and public buildings during the latter half of the nineteenth century and early twentieth century. Notable early residential structures include the Greek Revival Alexander Faribault House (1853, Faribault, placed on the National Register in 1970), the Greek Revival/Italianate Martin House (1869, Dundas), and the Drake Farmhouse (c. 1863, Dundas), a well articulated vernacular farmhouse constructed of locally manufactured brick. The styles popular in residential architecture during the last quarter of the nineteenth century, Rice County's period of greatest development, are particularly well represented. 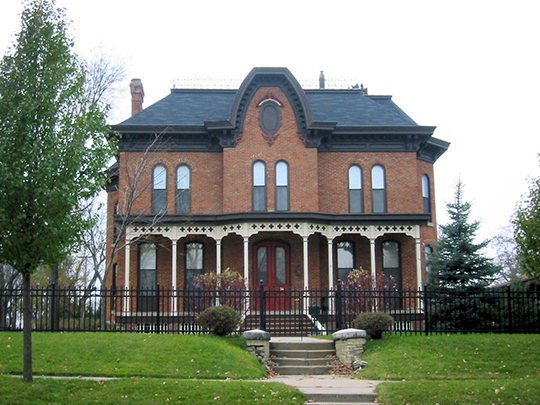 The Hudson Wilson House (1876, Faribault) is a notable example of the French Second Empire style; the DOH. Lord House (1887, Northfield), the Nutting House (1887-88, Northfield, placed on the National Register in 1970), the John Hutchinson House (1892, Faribault), and the Laura Baker School (c. 1880, Northfield, placed on the National Register in 1978) represent variations of the two principal Victorian styles — the Queen Anne and Eastlake; and the Cassius M. Buck House (1895, Faribault) is a particularly good example of the Neo-Classical Revival style. Dundas' Ault Store (1866, Dundas), the Northfield Historic District (c. 1865-1900, Northfield, placed on the National Register in 1979), and the Faribault Historic Commercial District (c. 1870-1900, Faribault) together represent variations of all major nineteenth century commercial architectural styles, ranging from the early vernacular stone construction of the Ault Store to examples of Commercial Gothic, Italianate, Queen Anne, and Romanesque. The continuity of scale, design, materials, and comparative lack of recent intrusions of both commercial district make them particularly noteworthy groupings. The ecclesiastical architecture of the county ranges in scale and complexity from the pair of vernacular churches at Valley Grove (1862/1894, Wheeling Township) to New York architect James Renwick's Gothic Cathedral of Our Merciful Saviour (1862-69, Faribault, placed on the National Register in 1979) and its associated Guild House (1894/1905, Faribault, being amended to the Cathedral nomination). Other distinctive ecclesiastical designs are represented in All Saints Church (1866, Northfield), Church of the Holy Cross (1868, Dundas), and Shattuck School's Chapel of the Good Shepherd (1871-73, Faribault, placed on the National Register in 1975, all Gothic designs; Carleton College's Skinner Memorial Chapel (1916, Northfield), Late Gothic Revival; the Congregational Church of Faribault (1867, Faribault, placed on the National Register in 1977), Romanesque; and the Annunciation Church of Hazelwood (1913, Webster Township), Shingle Style. The private and state educational institutions on Faribault's east side and Northfield's two college campuses contain some of the most architecturally distinctive concentrations of buildings in southern Minnesota. The Shattuck Historic District (which includes Shumway Hall/ Morgan Refectory (1887-88, Faribault, placed on the National Register in 1975). Old Phelps Library (1869-1900, Faribault, placed on the National Register in 1975 and Chapel of the Good Shepherd (1871-73, Faribault, placed on the National Register in 1975) constitutes a remarkable concentration of academic buildings ranging in construction from 1869 to the 1950s, and representing all phases of the institution's development. The Gothic tone for the campus was set with the construction of Old Phelps Library and the Chapel of the Good Shepherd and was continued into the early 1900s and 1920s with the construction of a number of Late Gothic Revival structures. St. Mary's Hall (1926, Faribault) located at Shattuck's sister campus to the south in another distinctive Late Gothic Revival academic building. Johnston Hall (1888, Faribault, placed on the National Register in 1975) is a locally distinctive academic building designed in the Romanesque style dating to the 1880s. The first principal buildings at Carleton and St. Olaf, Willis Hall (1868-72, Northfield, placed on the National Register in 1975) and Old Main (1877, Northfield, placed on the National Register in 1976) are designed respectively in the French Second Empire and Victorian Gothic. Both are good examples of the styles considered appropriate for academic institutions at the time of their construction. Two prominent building constructed at Carleton in a later period demonstrate the Romanesque Style for institutional buildings: Goodsell Observatory (1878, Northfield, placed on the National Register in 1975) and Scoville Memorial Library (1896, Northfield). St. Olaf's Steensland Library (1902, Northfield) represents yet another popular style utilized on college campuses in the midwest, the Neo-Classical Revival. Structures constructed at the state institutions during the same period differed little from those at private institutions. They also were of masonry construction, large in scale, and conscientiously placed in a campus setting. Noyes Hall (1901-1910, Faribault, placed on the National Register in 1975) located on the School for the Deaf campus is one of a diminishing number of pre-WW I state institutional buildings and one of Faribault's most distinctive ones. Rice County contains several notable examples of a range of public building styles. The Lonsdale Public School (1908, Lonsdale, placed on the National Register in 1979) presents a striking rural school scene on its hilltop setting. The design and frame construction of the school contrast notably with the educational structures at the county's state and private institutions. Two periods of public building design are represented in Faribault by the Renaissance Revival Faribault City Hall (1894, Faribault), representative of turn-of-the-century municipal buildings; and the Thomas Scott Buckham Memorial Library (1930, Faribault) and the Rice County Courthouse (1932-34, Faribault), examples of variations of the Art Deco style as utilized in large public buildings. All About Northfield, Minnesota; Directory of Names and Business Firms, Northfield: Northfield News: 1889. Berg, Lillie Clara, Early Pioneers and Indians of Minnesota and Rice County, San Leandro, California: 1959. Carlin, Lynn, ed., Continuum: threads in the community fabric of Northfield, Minnesota, Northfield: Northfield Printing, Inc., 1976. Curtiss-Wedge, Franklyn, ed., History of Rice and Steele Counties Minnesota, Chicago: H. C. Cooper, Jr., Co., 1910. Faribault Minnesota Citizens' Committee, Faribault and Vicinity, Faribault: 1884. Frink, F.W., A Record of Rice County, Minn., in 1868, Faribault: Central Republican, 1868. __________, A Short History of Faribault, Faribault: Central Republican, 1901. Hagerty, Mary L., Meet Shieldsville, 1940. Larsen, Arthur J., "Various Nations Contributed to Early Settlement of Rice County," Northfield News, May 19, 1933. Neill, Rev. Edward D., History of Rice County, Minneapolis: Minnesota Historical Co., 1882. Nerstrand Women's Club, History of Nerstrand Community, 1949. 100 Years in Morristown, 1855-1955. Swanberg, L.E., ed., Then and Now, A History of Rice County, Faribault, and Communities, Faribault: 1976. Andreas, Alfred Theodore, An Illustrated Atlas of the State of Minnesota, Chicago: A.T. Andreas, 1874. Fisher, Walter I., Insurance Maps, St. Paul: Minnesota Historical Society Map Library. Census Records, State and Federal. Plat Book of Rice County Minnesota, 1900. Plat Book of Rice County Minnesota, 1915. Sanborn Insurance Co. Maps, St. Paul: Minnesota Historical Society Map Library. Bloomberg, Britta, Minnesota Historical Society, Rice County Multiple Resource Area, nomination document, 1981, National Park Service, National Register of Historic Places, Washington, D.C.